Rhinos; the name "rhinoceros" translates directly from Greek as "nose-horn". They possess at least one horn (sometimes two), that is growing from the top side of the nose. The "horns" lack a bony core and are comprised of compressed hair. Having purported medicinal properties and are also used to make traditional ornaments - as a result, all of them have been hunted to the brink of extinction. They are also wallowers and will often find a suitable water hole and roll in its mud, coating their skin with a natural bug repellent and sun block. They have sharp hearing and a keen sense of smell. The eye sight might not be that great, but they will find one another by following the trail of scent each enormous animal leaves behind. Black: have various habitats, but mainly areas with dense, woody vegetation. White: live in savannas with water holes, mud wallows and shade trees. The 'Black' is a browser, with a triangular-shaped upper lip, best referred as 'hook-shaped'. It eats a large variety of vegetation, including leaves, buds and shoots of plants, bushes and trees. The 'White', on the other hand, is a grazer feeding on grasses. The 'white' name derives from the Dutch word "weit", meaning wide. As a reference to its wide, square mouth which is excellent for grazing. It is not a very common thing to find them these days in the wild. So, seeing one or two is a fantastic sight! Unfortunately poaching is still on the rise and these animals are in desperate need of our protection; lets make sure we do that!! The Swahili name is Faru; the scientific names are Diceros bicorn for the black, and Ceratotherium simum for the white. The size can be about 60 inch at the shoulder. Predators are: Humans. They live between 35 to 40 years. The diet is vegetarian and the weight can be 1 to 2 tons for the black, and over 2 tons for the white. 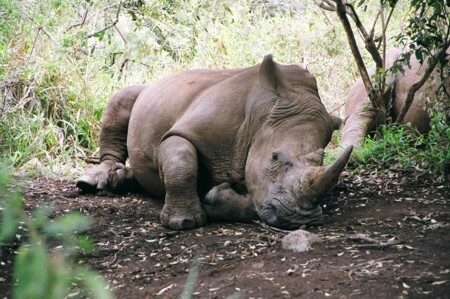 This white one was taking a nap at the Masai Mara Rhino Sanctuary. As was the next one. We had a chance to get VERY close and it was a bit scary, but very exciting! 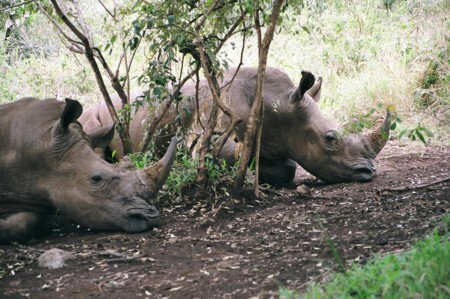 The breeding programs in Kenya have been very successful after having a bad history of poaching. The white species was introduced as part of a species conservation program from South Africa. You are more than welcome to use these photos for personal use. I trust, you won’t reproduce or sell them without asking for permission. To get in touch with me, please Contact me here! The Rhinocerotidae arose during the Eocene, likely from tapir-like ancestors. They rapidly colonizing Eurasia and North America, and then invading Africa during the Miocene. They became a highly successful group: at least 30 genera are known in the fossil record. Modern rhinoceroses are restricted to tropical and subtropical climates, but several cold-adapted species once existed, including the woolly rhinoceros (Coelodonta) from the Pleistocene. Today, they are found in eastern and southern Africa and to southeast Asia. 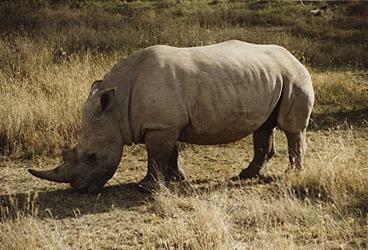 African rhinoceroses tend to inhabit more open terrain than the forest-dwelling Asian species.